As we introduced larger and larger cutting tables in both our OMAX and MAXIEM product lines we found a rapidly-expanding market in the fabricating industry. This lead to an ever-increasing number of customers who wanted to cut panels requiring weld-prep beveled edges. These edges traditionally require time-consuming secondary processing, often using labor-intensive hand-held grinders. What was clearly needed was a simple way to create a beveled surface as part of the basic panel-cutting process. Enter the A-Jet. The A-Jet is a fully articulated abrasive waterjet cutting head that can cut a bevel at any user-specified angle up to 60 degrees from vertical. Because larger panels often have slightly warped surfaces, the A-Jet can be fitted with a terrain-following system that automatically maintains a constant stand-off distance from the material being cut. This assures accurate bevel dimensions regardless of the surface irregularities of warped material. The A-Jet is completely controlled by the OMAX Intell-Max control software. 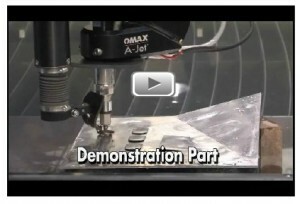 The user can easily program a desired bevel size and angle along any segment of the panel being cut. We find that our customers are not only using the A-Jet for weld-prep bevels, but are also using it to create other desired bevel features such as countersinks, chamfers and angled surfaces. Like all OMAX/MAXIEM accessories, the A-Jet and Terrain-Follower are designed for simple retrofit to existing OMAX/MAXIEM systems. This allows our existing customers to increase their capability, expand their applications and broaden their markets without the need to purchase an entirely new machine. The Terrain-Following A-Jet is just another example of how expanded capabilities can lead to expanded applications and a broader range of abrasive waterjet users. Remember, our goal is an abrasive waterjet in every shop.